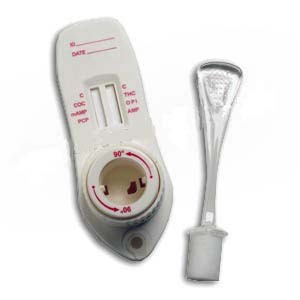 Allow test device, urine specimen to reach room temperature (15-30°C) prior to testing. Wait for the colored line(s) to appear. The result should be read at 5 minutes. It is important that the background is clear before the result is read. Do not interpret the result after 10 minutes. NEGATIVE:* Two lines appear. One colored line should be in the control line region (C), and another apparent colored line should be in the test line region (T). This negative result indicates that the Cotinine concentration is below the detectable level (200 ng/mL). *NOTE: The shade of color in the test line region (T) may vary, but it should be considered negative whenever there is even a faint line. POSITIVE: One colored line appears in the control line region (C). No line appears in the test line region (T). This positive result indicates that the Cotinine concentration exceeds the detectable level (200 ng/mL). The COT One Step Cotinine Test Device (Urine) provides only a qualitative, preliminary analytical result. A secondary analytical method must be used to obtain a confirmed result. Gas chromatography/mass spectrometry (GC/MS) is the preferred confirmatory method..